HELLO Stojo! Goodbye disposable Cups! Sip, stow and go! Americans throw away 58 billion disposable cups each year. Reusable cups help reduce waste, but only to the extent people choose to use them. When you live on the go, adding a bulky travel mug to the equation isn’t always an option. All too often, we choose the convenience of a disposable cup over doing the right thing for the planet. The Stojo Biggie cup provides a better way. 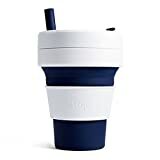 Both reusable and convenient, the ultra portable Stojo Biggie cup is the world’s only leak-proof reusable cup that fits in any pocket, purse, glove compartment, backpack or laptop bag. It’s always there when you need it. When you’re done with your drink, simply collapse the cup, seal the lid, stow and go.